AUGUSTA, Ga. — The Wall Street Journal published a detailed and fascinating look at how Augusta National Golf Club, via a slew of real estate LLCs, has bought up vast swaths of property around its famed golf course. 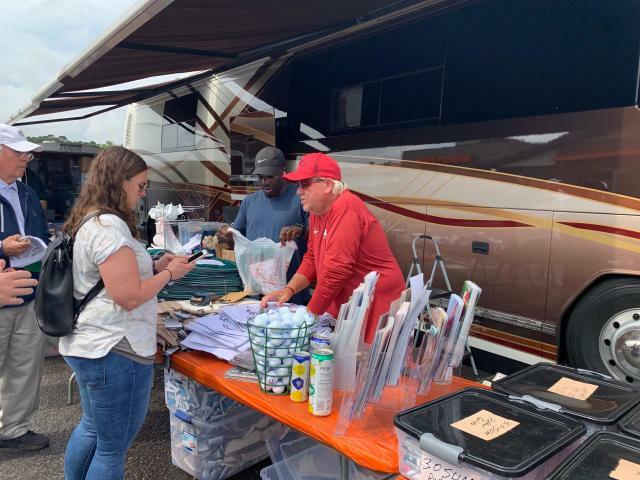 What the club is going to do with all the land remains unknown, but there was one particularly concerning development to fans of a Masters tradition unlike any other — John Daly setting up his RV in the parking lot of Hooters and selling merch and signing autographs. As the Journal reported, one of the plots of land the exclusive and tony country club now owns is the very strip mall where Hooters resides. Could this be the end of Daly hawking blue-collar gear … let alone chicken wings and orange-clad waitresses in what is sometimes referred to as a “breast-a-raunt”? Thankfully, no. At least according to Daly, neither he nor Hooters are going anywhere. “From what I understand, I was told they did a 20-years lease and they put me in the lease,” Daly said Friday morning. “I doubt I’ll be here by then, I’ll be 73, but you never know. Well, yes, as long as that doesn’t happen. It stands to reason Augusta National is aware of such signings. Daly is hardly hiding it. His RV is prominently parked just steps from the gates of the most prestigious club in America. What goes on in there is the official Masters Tournament. What goes on out here is the other side. And it has been for years. Daly played the Masters 12 times, but other than finishing third in 1993, never had much success. He missed the cut in his final three appearances (2004-06). Still, he remains a golfing folk hero not merely for his two major championships (1991 PGA, 1995 British) but his grip-it-and-rip-it ethos on the course and off — which includes chain smoking and hard partying. He’s Arkansas through and through, a rare man of the people in a country club sport. Thus, the fans still come out, and there is no place better for him to hang out than outside a kitschy chicken joint that for years staged a “Miss Green Jacket” contest. He used to be up at a jewelry story but says this is “10 times better” and certainly more on brand. The one threat to change is that Augusta’s grand plan includes not just expanding parking or housing, but perhaps even putting its own exit ramp from the interstate that would run directly to the club. That would siphon off traffic and spare the “patrons” (as Augusta National calls fans) from seeing the rolling circus of chain restaurants and pop-up ticket brokers that line Washington Road. This is the only such event Daly does, pulling in from Dardanelle, Arkansas, to hang out for a week and make some money. There is plenty of it. You can buy just about anything — wild sports coats, Daly T-shirts, autographed balls, Daly’s Grip and Sip It tea or even just a selfie. It’s all for sale. Just Thursday a guy literally purchased the shirt off Daly’s back — game-worn, you could say. It continues post-round when so many fans come that Hooters has constructed a huge tent to handle them all. Beers and wings are served, and a weird slice of the Masters continues on. And apparently will continue on despite Augusta National’s growing real-estate empire. “I think it’s great,” Daly said. “Hey, I’ve always had respect for the members and the guys in there.